Chlorine pools are the most common type of pools built today. Chlorine filter systems are relatively easy to operate and maintain. In addition, most professional pool supply stores stock chlorine tablets so it’s easy to ensure the proper chemicals are available. How chlorine systems work is that chlorine is added regularly to either a pump unit that circulates your pool water or through a floating disbursement device that has tablets that dissolve over time. Chlorine is added to kill mildew, mold, and bacteria that can grow in your water. 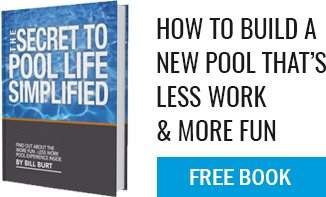 Salt pools use dissolved salt instead of chlorine to maintain clean and balanced pool water. With this type of system, a salt chlorinator unit uses electrolysis to slowly add salt to the water to maintain a consistent salt-water ratio. One thing that’s significantly different from chlorine systems is that salt in the water never disappears like chlorine, so you end up having to add small increments to maintain a properly balanced pool. Both water cleaning methods produce great results that end in clear, sparkling pool water that you and your family can enjoy. The decision is mostly up to personal preference and what you feel your pool needs are!